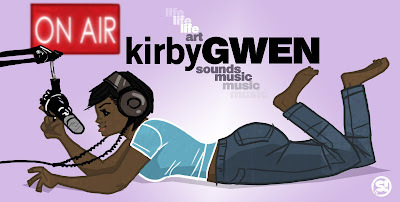 Here's a banner I did for my girl Kirby's (aka Kirbalicious) blog. Why "Kirb of all trades" you ask? Well that's because she's an illustrator like myself AND she's the host of very own radio show "The 1 O' Clock Takeover," which you can check out every Tuesday at 1 PM over at WXOU.ORG. I happened to be guest on there along with Randall one day so trust me, it's a great show. And that is why she's dope. 'Nuff said. ....I think I'ma start using "'nuff said" for now on.